I love the drum majors and the flag twirlers. I love the clowns, and the riding teams. Most of all, I love the floats! 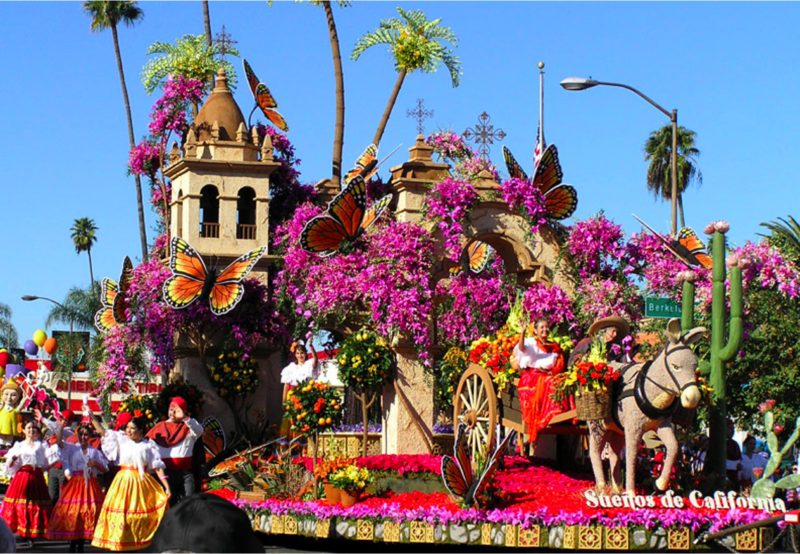 Watching the Tournament of Roses parade is the New Years day activity of choice around my house. It’s a family tradition: breakfast and the parade, with coffee. My eldest commenting on whether or not the band is in step, and reminding us of the more odoriferous things one must avoid without losing the beat. My youngest watching the horses with a covetous eye. The skill of the flag and rifle teams. (I always wonder how they manage to escape the parade route without a concussion.) Then there’s the skill of the flag and rifle teams. I always wonder how they manage to escape the parade route without a concussion, mostly because I know I would never make it. But it’s the floats that get me every time. The artistry. The attention to detail. The limitations and glory of creating a work of art out of PLANTS. Watching them move along the parade route makes me want to join one of the construction teams. Floats aren’t that different from books. Books take months, if not years to create. There is just as much artistry and painstaking effort involved, though of a different kind. And when the writer does his job correctly – the results can be inspiring. So why not have a book parade? Silence stretches, crickets chirp. Right? We couldn’t think of a reason either, and thus was the Indie Lights Book Parade born! Why should you attend the parade? It provides healthy brain food. No snacks will be provided, so you have to bring your own, healthy, low cal food stuffs. Plus, everyone knows that the excitement of a parade burns lots of calories, so really, even if you chose to indulge in popcorn and chocolate, it would likely be a wash as far as calorie count goes. This is an opportunity to slim your body and pump up your brain, and who doesn’t want a fat brain? It will spice up your life. Fifteen fantastic authors are participating so there is a little something for everyone. Mystery, romance, adventure, and even fairy dust, will abound in this parade. You can visit every blog at every stop, or pick and choose where to go on any given day. Parade routes will be posted on every blog, so you’ll never need to stop and ask for directions. It’s an opportunity to find the book of your dreams. Yes, literary passion has been sparked at book parades and we have so many great books, finding one to fall in love with is nearly a foregone conclusion. Pet lover, child, and history buff alike will find a book to love on our parade route. There are PRIZES! The authors have donated some great prizes to the raffelcopter give away on this parade. From gift cards to e-books, you can win, just for watching the parade and leaving us some confetti to remember you by. (And by confetti, I mean comments and follows, mostly. Though if you want to mail me some actual confetti, I won’t complain.) Quickly deletes mailing address. So come to the parade! We head out on February 2nd and will be making stops on Mondays, Wednesdays and Fridays through the 27th. We’ll even throw in bonus stops on the 10th and the 26th, just for fun. Doesn’t matter where you start because every author will be posting every day. It’s going to be a blast and you might just get yourself some SWAG along the way.